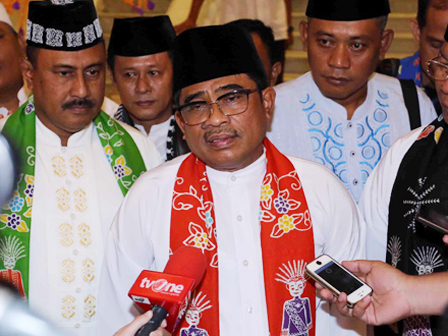 Acting Jakarta Governor (Plt) Sumarsono said that Betawi culture is used as creative economy development basis. One of examples is to build Betawi Store in Lenggang Jakarta area, Monas, Central Jakarta. "This is for creative economy development and because we're in Jakarta, we make it with Betawi culture basis "
" This is for creative economy development and because we're in Jakarta, we make it with Betawi culture basis ," he said after launching Betawi icon at City Hall, Sunday (2/5). Betawi Community Deliberation Council (Bamus) Chairman, Zainudin, added that in the near future Betawi Store will be equipped with Gigi Balang ornament. It also selsl various models of culture miniature, souvenir, and Betawi traditional food. "Thus local and foreign tourists could come to see Betawi culture directly in one place," he expressed. To the next development, he explained that Betawi local product will be sold online and using social media. Gradually Betawi Store will be build in all city's area in Jakarta.